1998 Viper V-500 mdl. VMC-500-P CNC Vertical Machining Center s/n 106317-115 w/ Mitsubishi Controls, 16-Station ATC, CAT-40 Taper Spindle, 6000 Max RPM, Rigid Tapping, 16” x 32” Table, Coolant. 1991 Southwestern Industries / Proto Trak 4-Axis CNC Vertical Machining Center s/n 092DJ62561 w/TRAK LPM CNC Controls, 16-Station ATC, CAT-40 Taper Spindle, 6000 Max RPM, Chip Auger, USB Port, Coolant. 2005 Trak mdl. DPM3 3-Axis CNC Vertical Mill s/n 062CF14434 w/ Proto Trak SMX CNC Controls, 40-5000 Programmable RPM, 40-Taper Spindle, Power Drawbar, Coolant. 2003 Trak mdl. K4 2-Axis CNC Vertical Mill s/n032AL12156 w/ Proto Trak SM CNC Controls, Chrome Box Ways, Power Knee, Power Drawbar, 40-Taper Spindle, Tool Mist, 10” x 50” Table. 2006 Trak mdl. K3 2-Axis CNC Vertical Mill s/n073CK15600 w/ Proto Trak SMX CNC Controls, 60-4000 Dial Change RPM, Chrome Box Ways, Power Knee, Power Drawbar, R8 Spindle, Tool Mist, 10” x 50” Table. 2013 Trak mdl. TRL 2460SX 24” x 60” CNC Gap Bed Lathe s/n 132CV462663 w/ Proto Trak SLX CNC Controls, Advanced Programming Features, 40-1800 RPM, Auto Tool Indexer, Tailstock, Pneumatic Collet Closer, 15 1⁄2” 3-Jaw Chuck, 12” 3-Jaw Chuck, Coolant. 2007 Trak mdl. TRL 1440EX 14” x 40” CNC Lathe s/n 081DH16371 w/ Proto Trak ELX CNC Controls, 60-2400 RPM, Tailstock, Dorian Tool Post, 8” 3-Jaw Chuck, 6” 3-Jaw Chuck. 2005 Hurco mdl. TM8 CNC Turning Center s/n TM8- 01006124AAA w/ MAX Controls, Tool Presetter, 10-Station Turret, Hydraulic Tailstock, 4500 Max RPM, Parts Catcher, Chip Conveyor, 8” 3-Jaw Power Chuck, 5C Collet Closer Nose, Updated Work Lamp, Coolant. 1997 Acra mdl. AM-3V Vertical Mill s/n 001731 w/ Newall DRO, 5000 Max Variable Speed RPM, Chrome Box Ways, Power Feeds, Power Knee, Power Drawbar, 10” x 54” Table. 1997 Acra/Namseon mdl. 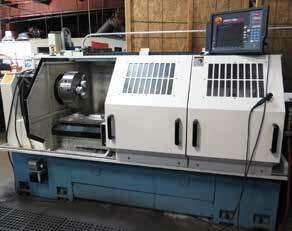 1640 16” x 40” Geared Head Gap Bed Lathe s/n 20102634 w/ Newall DRO, 23-1800 RPM, Inch/mm Threading, Tailstock, 18” 3-Jaw Chuck, 12” 3-Jaw Chuck, 12” 4-Jaw Chuck, 8” 3-Jaw Chuck. 2004 Amada mdl. HA-250W 10” x 12” Automatic Hydraulic Horizontal Band Saw s/n 25750200 w/Amada Controls, Hydraulic Clamping And Feeds, Carbide Guides, Bundling Attachment, Chip Auger, Conveyors, Coolant. Leten mdl. DCM5 Vertical Band Saw s/n 500395 w/ Blade Welder, Dial Speed Change. 1999 Pedrazzoli mdl. SB350/60 15” Miter Cold Saw s/n 030716 w/ 2-Speeds, Speed Clamping. DeWalt 14” Miter Cutoff Saw. DoAll mdl. DH-612 6” x 12” Surface Grinder s/n 138-61900 w/ 5” x 10” Magnetic Chuck. Champion 10Hp Horizontal Air Compressor w/ 120 Gallon Tank. 5Hp Horizontal Air Compressor w/ 80 Gallon Tank. Central Machinery 6” Belt/8” Disc Sander w/ Stand. (2)Miller Syncrowave 300 AC/DC Arc Welding Power Sources s/n’s JG068507, HG070701. Miller CP250TS CP-DC Arc Welding Power Source. 5C Indexing Heads and Spin Fixtures. Carbide and HS Endmills, Drills, Taps, Reamers and Perishable Tooling. MicroVu mdl. M14 14” Floor Model Optical Comparator s/n 3690 w/ Acu-Rite II DRO, Surface and Profile Illumination. 36” x 60” x 8” 2-Ledge Granite Surface Plate w/ Stand. 24” x 36” x 5” 2-Ledge Granite Surface Plate w/ Roller Stand. 2000 Toyota Tundra 10’ Stake Bed Truck Lisc# 7D73288 w/ V6 Gas Engine, 5-Speed Manual Trans, GM Dually Rear End, AC, VIN# 5TBJN321XYS111881. Toyota mdl. 7FGCU20 4000 Lb Cap LPG Forklift s/n 61137 w/ 2-Stage Mast @ 131.5” Lift Height, Side Shift, Cushion Tires, 1026 Metered Hours, Recent Full Service and Inspection. Materials Including, Aluminum, Stainless, Brass, Bat, Tube, Angle and Flat Stock w/ Racks. Pallet Racks, Shop Tables and Carts.